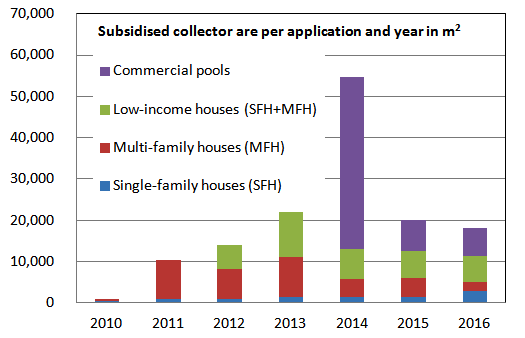 The California Solar Initiative (CSI) – Thermal Program seems to have stabilised at around 20,000 m² (or around 200,000 ft²) of subsidised collector area per year. Commercial applications dominate the statistics, although there was a spike in the share of residential systems in 2016. The peak in applications for commercial pool heating in 2014 was due to the late addition of this type of system to the state subsidy scheme. It took almost a year before the level of incentives and other requirements were set, so that all the applications piling up over that period had to be processed in 2014. The data in the chart was provided by the California Public Utilities Commission (CPUC) and shows the subsidised and installed collector area for each year. “The reported total collector area for commercial and multi-family buildings for 2016 is not yet final and will increase over time, since projects in these categories have 18 months from their application date to complete installation and receive payment,” explained Asal Esfahani, Regulatory Analyst at the CPUC. The chart includes completed projects only. “In our experience, multi-family housing with centralised hot water systems is one of the best applications for standard solar thermal systems in our region. 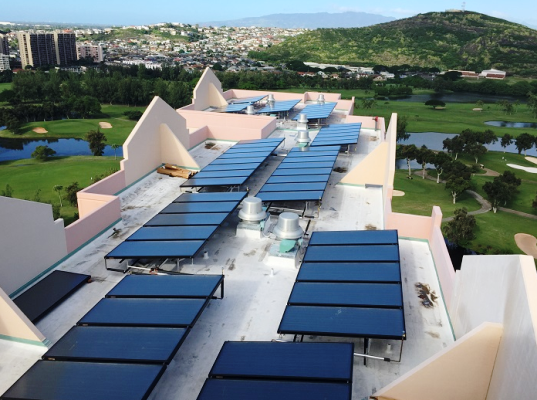 These systems utilise minimal area on the rooftops and pay back the quickest for the owner,” William Chen, Adroit Energy’s COO and Vice President of Engineering, was quoted as saying in an article in Sun & Wind Energy 4/2016. Adroit Energy is based in San Diego and has already realised around 120 commercial solar water heater systems, according to CSI’s online statistics. Country Club Village in Honolulu, Hawaii. The collectors were stand-mounted on the flat roofs of two 22-storey buildings. The Sun & Wind Energy article said that the USD 1.5 million project had been completed in only six weeks by using a helicopter to carry the collectors to the roofs. The system includes three large Haase Energy Tanks made in Germany. The CPUC counted twice as many installed residential solar water heaters last year (2,962) as in the year prior (1,284). Esfahani explained the high growth to have been prompted by a temporarily higher incentive of 70 USD per therm displaced (usually, 29.85 USD/therm) across the service area of the Southern California Gas Company. It had been raised in response to a natural gas leak discovered at the Aliso Canyon storage facility in 2015. “The measure was meant to mitigate or avoid gas shortages as a result of the leak, and the requirement was for the systems to come online by the end of 2016,” she explained. Many households profited from the increase in subsidy money. There was no comparable impact from the temporarily higher incentive of 25 USD per therm displaced (usually, 20.19 USD/therm) for multi-family properties, as commercial projects have longer planning and implementation periods. In October 2015, SolCalGas employees discovered that gas escaped from a well in an underground storage facility near Los Angeles and it took them until February 2016 to get the leak under control. Since February 2013, installations providing solar heat for industrial processes (SHIP) have been eligible for CSI subsidies as well. So far, however, the statistics have not shown any applications for industrial use. SHIP is an entirely new field in the United States with very few references so far, which means it is probably a big challenge to convince stakeholders from manufacturing to invest in solar heat. To jump-start this new segment, it will be essential to extend the CSI scheme beyond 2017. The probably largest SHIP reference in California is the 5,387 m² (57,969 ft²) field of parabolic trough collectors installed in 2008. It heats the oil used to fry potato chips at the Frito-Lay plant in Modesto.